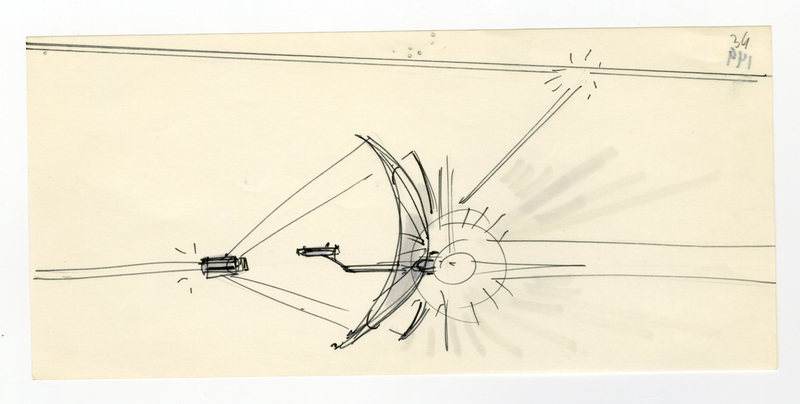 This is an original storyboard drawing from the Walt Disney Studios production TRON (1982). This storyboard drawing features development designs and was created at the studio and used during the production of the film. The overall measurements of the piece are 4.25" x 9" and the image itself measures 4.25" x 9". The full color image shown is a reference screen grab from the film, which appears to be the scene that this piece was used to develop. This image is just for reference and is not a physical print included with the art.